First I will write the lyric, then describe the music video that played in my mind. The song is still haunting me & I find myself singing it on the way to work in the morning & on the way home in the evening. The melody comes from the music used during the funeral scene in Jackie's film "New Police Story". (The song plays like a love song until you see the music video) This is not meant as a comment that Jackie is overwhelmed by his fans or people that love him or make demands on him for charity work or fan requests or anything like that. It is a love song with signs of what he tries to do for charity & what he wishes he could do for charity. Now as the song is played, you see Jackie in a beautiful tropical setting singing. Then you see him standing at a cliff looking out as if he longs to let go of his burdens. NOT suicide by any means, just a release of his worldly burdens. (He's a character in this video, not portraying HIMSELF). Then you see a scene of him in a gorgeous bedroom. It is decorated in shades of wine & burgundy, & he is wearing a silk bed robe that matches. The room is filled with hundreds of lit candles. Jackie is overwhelmed by love, as if he can't handle how he feels. Dispite the heat from the candles, he shudders as if he is freezing. In between the chorus of "I'm Overwhelmed" in which these lovely romantic scenes take place, are snippets of Jackie's charity work, either several seconds long clips of video footage from his charity tours, or stills from his tours like the amazing ones Kath has shared with us on Jackie's website. Sometimes they are shown in color, sometimes in black & white for an "artsy" effect. Another scene is shown in black & white & Jackie is sitting on a chair at an abandonded petrol station. The place is dirty, grimey, & the chair is rusted crome with a torn vinyl cushioned seat (like the 1950's chrome kitchen sets from the USA). The seat is either green or blue, even tho the scene is in black & white. Jackie is wearing flips flops, torn jeans, & a white T-shirt that is perfectly clean. He is not singing as the chorus plays. Slowly, he is being drenched in CHOCOLATE. Random cuts of the scene show him closeup, (tight shot, cut aways, wide shots, etc) all from the front, & finally for a few seconds the scene is in color & Jackie looks into the camera as the chocolate pours down one side of his face & he smiles as if that is the most wonderful thing that has ever happened to him, almost seductively. The oozing chocolate signifies decadence, indulgence, wanting something you shouldn't have. At the end of the video, Jackie is at the cliff again (a cliff that professional cliff divers use), & he jumps off (of course, this can be a stunt double or CGI) & it cuts to him as he hits the water (a studio shot done in a tank, of course) in slow motion & he sinks with a content look on his face as the video fades out. This signifies he has chosen to accept the things he cannot change & change the things he can. I hope you find this fun, it was an incredible experience to dream it up!! Love to ALL of Jackie's wonderful fans & love to his staff & of course, to Jackie himself. 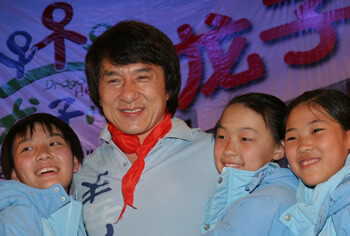 Thank you Jackie, for sharing your life with us on this web site!